Several years ago I discovered the health benefits of Sea Berry (also known as Seabuckthorn ), via the Sibu brand. Seabuckthorn is native to the Himalayan Highlands. It's a tiny fruit that contains extremely large amounts of multiple types of Omega acids, which are vital to collagen production and healthy skin, hair and nails. Sibu has expanded their range of products and the Sibu Seabuckthorn Purifying Mask is one of my new favorites from the Luminate skincare line. Sibu Seabuckthorn Purifying Mask is a toxin-absorbing bentonite clay based mask with a unique feature. 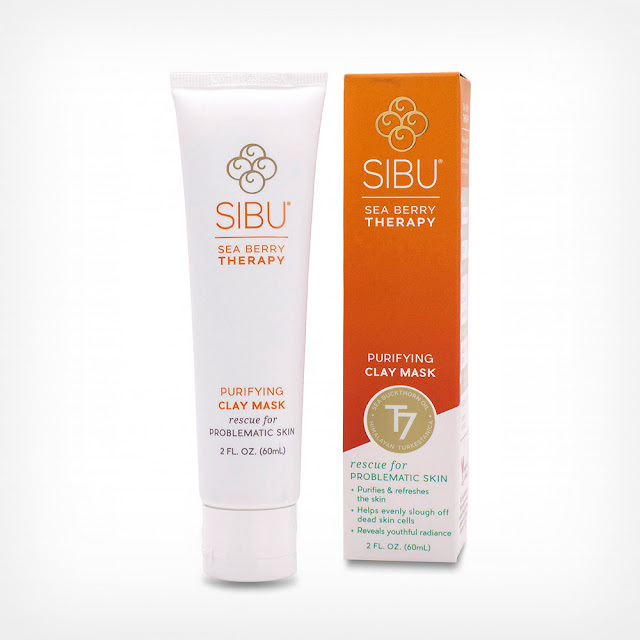 Sibu Seabuckthorn Purifying Mask is creamy with a lightweight texture out of the tube and going on the the skin. But after the mask dries, it doesn't become hard, remaining slightly moist. It becomes grainy and works to slough off dead skin cells by exfoliating when you rinse it off. I loved using Sibu Seabuckthorn Purifying Mask in the morning to get a great start on the day, adding a thin layer to my skin. residue. My skin felt clean, but not overly stripped and it had a freshly scrubbed glow. I applied about 2-3 times a week. *This product was provided courtesy of Sibu PR for reviewing purposes.